Bedford Town were sent crashing out of the FA Trophy with a comprehensive 4-0 defeat at the hands of Hanwell Town on Saturday. The visitors were dealt a blow in the warm up as Lee Roache had to be replaced by Jemale McKenzie-Lowe, while they had strong penalty claims for handball on 18 minutes but nothing was given. Nathan Frater saw yellow for Bedford midway through the half and Jon Taylor’s men were behind moments later when Sam Hurrell’s free kick was nodded home by the unmarked Mark Jamison. Hanwell doubled their lead on 39 minutes when Callum Duffy’s deflected shot beat Ashley Harris, while the Eagles went close to reducing the deficit, Phil Draycott’s effort saved by Melvin Minter. Luke Knight then saw his free kick well handled by Minter, with Hanwell breaking as Harris had to deny Bradley Simmonds. After the break, the game was quickly put beyond Bedford as Harris made a good stop, but Will Turl fired the loose ball home. McKenzie-Lowe shot over the bar before being replaced by George Boland, while both Tommy Hull and Duffy were booked, before Eagles brought on Sam Baffour and Hammed Lawal. Matt Clifford entered the referee’s notebook, while Hanwell had their fourth with 14 minutes to go through Tyler Christian-Law. Bedford have been drawn away to St Ives Town in the Southern League Challenge Cup next month. 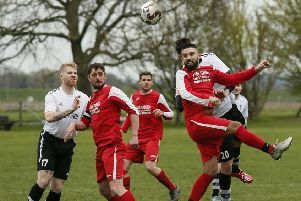 Meanwhile, the Eagles, for whom Ollie Sutton left last week returning to St Ives Town, are in league action this weekend when they visit Chalfont St Peter. Eagles: Harris, Farrell, Clifford, Hull, Peters, Knight (C), Stanley (Baffour 65), Watkins, McKenzie-Lowe (Boland 60) Frater, Draycott (Lawal 65). Subs not used: Harpur, Roache.